Children love to identify patterns! 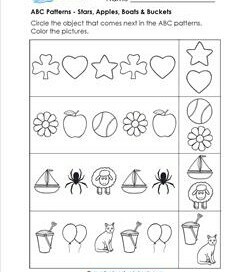 These worksheets have ab, abc, abcd (and more) patterns with pictures of objects children will easily recognize. Though I call these abc patterns, there is actually only one page where children label the patterns using A, B, and C. In all the rest they circle the object that comes next. Kids can color the objects to create a pattern as well. They can say the pattern using A, B, and C, or they can say the object pattern or the color pattern. Lots of options here! Fun in the sun! You know summer has begun when you can hit the beach. 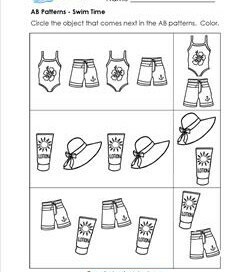 Circle the down at the beach object that comes next in the ABC patterns. Color. AB Patterns – Swim Time! Get your swimsuits on! Let’s have some fun times at the pool! But wait! Don’t forget the sunblock. Circle the object that comes next in the ABC patterns. Color the pictures. 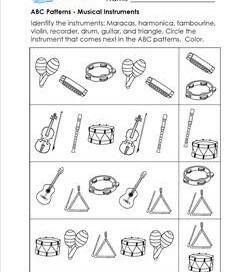 Time to make some noise with this ABC patterns worksheet. Circle the musical instrument that comes next in each pattern and then color. 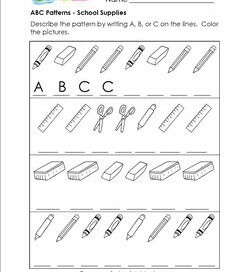 In this ABC patterns worksheet you will find pencils, crayons, markers, erasers, scissors and rulers. Describe the pattern by writing A, B, or C on the lines. Color the pictures. 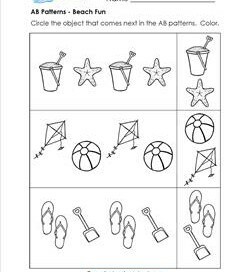 Lots of various objects – stars, apples, boats and buckets, for example – in this ABC patterns worksheet. Circle the object that comes next in each pattern. Color. 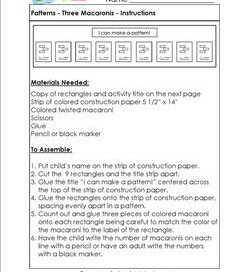 A simple ABC patterns activity using colored macaroni. Write the number 3, glue three macaronis of the same color in each square, and glue the squares in a color pattern. Fun!